According to the Climate Council, the transport industry is the third largest source of Australia’s total greenhouse emissions. In 2016, the transport industry emissions had grown by 51% from 1990. As this number continues to increase, the Australian government, and other governments across the globe, continue to focus their effort on a more sustainable transportation future by phasing out high-emission vehicles from our streets. As part of the United Kingdom’s obligation to adhere to the targets under the Paris climate accord, the government recently announced plans to halt production of petrol cars by 2040, and work towards almost all cars and vans on UK roads to be zero emission by 2050. The new French President, Emmanuel Macron, announced a similar plan in early 2017 but suggesting the sale of petrol and diesel vehicles will end by 2040. As more governments make their own announcements on the future of transportation, it looks like future motorists will be using charging stations or filling up with alternative sustainable fuels. WHAT ARE LOW EMISSION VEHICLES? Current options for low emission vehicles are centred on two primary options – battery Electric Vehicles (BEV) and Fuel Cell Electric Vehicles (FCEV). Both options run off an all-electric drive train, with a battery to supply electricity to drive the wheels as required. However, a fuel cell vehicle also contains a power generator – a fuel cell that generates electricity from a supply of hydrogen on board the vehicle. Hydrogen is the perfect clean fuel, as hydrogen can be used to generate electricity – with absolutely no CO2 emissions. So which technology is better? Which will prevail? Most recently, automotive manufacturers are increasingly looking at a “horses for courses” solution, with no single solution, but instead developing both systems for different specific transport requirements. In the world of transportation, different sustainable fuelling options are continually being investigated. Though electric vehicles are often front of mind in regards to sustainability, hydrogen fuel cell vehicles are quickly gaining momentum. An increasing amount of trucks, trains, cars and ships are using hydrogen fuel cells as a power source, with the technology advancing to a stage where it’s now available commercially around the globe. Major automotive manufacturers such as Toyota, Honda and Hyundai are currently producing fuel cell vehicles, with many other manufacturers having released concept cars. When comparing to petrol and diesel cars, hydrogen fuel cell vehicles have very similar performance. 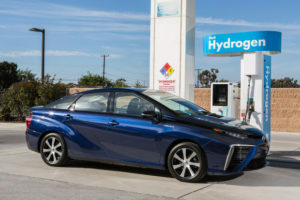 The specifics of a hydrogen fuel cell vehicle can vary depending on the manufacturer, but typically they can refuel in minutes and drive similar ranges to that of a petrol or diesel car. In regards to larger transport options, hydrogen vehicles are entering the market at a steady pace. In Germany, the world’s first fuel cell train is already undergoing trials, and Norway is one of many European countries now considering hydrogen-powered trains. In other transport sectors, fuel cells are being developed for trucks, boats and ferries. For hydrogen transport to succeed, vehicle manufacturers, fuel suppliers and governments need to work together. There is a need for more hydrogen vehicles to be available as well as sufficient refuelling infrastructure to make it a viable and attractive alternative for consumers. Most importantly, a low cost, scalable, reliable and low emission source of hydrogen fuel needs to be established. Shell has become a leader across the globe in working with different organisations to grow the hydrogen network. 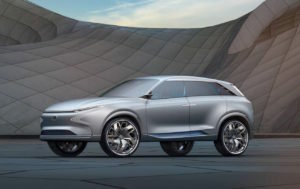 In Germany, Shell is part of a joint venture with industrial gas manufacturers Air Liquide and Linde, car manufacturer Daimler and energy companies Total and OMV, to develop a nationwide network of 400 hydrogen refuelling stations for new hydrogen car models by 2023. In 2017 it became the first branded fuel retailer to sell hydrogen at one of its retail sites in the UK. The new hydrogen refuelling station in Cobham, on the outskirts of London, is the first of three hydrogen stations Shell plans to open in the Southeast of England. Whilst in the USA, Shell has two hydrogen filling stations in Los Angeles, and is currently working in partnership with Toyota, with the support of the State of California, to further develop its hydrogen-refuelling network. 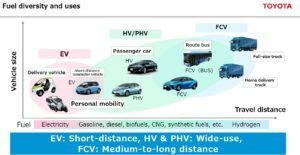 With the cooperation of vehicle manufacturers, fuel suppliers and government, as the hydrogen refuelling network continues to grow so should the accessibility and interest in hydrogen fuel cell vehicles. HAZER HYDROGEN: HOW DOES HAZER FIT IN? As a clean-burning fuel, it’s almost certain hydrogen will play a key role in the world’s automotive future. But despite the growing need for hydrogen, at the moment its production remains costly or carbon dioxide intensive. Hydrogen production requires two basic elements – a chemical feedstock to act as a source of hydrogen, and an energy source to in effect split the hydrogen out from the feedstock material to form pure hydrogen. Hydrogen atoms are the 8th most common type of atoms found on earth, but none if that hydrogen is present as pure hydrogen – it is bonded into other chemicals – principally in water, but also fossil fuels like natural gas or coal, or other bio-molecules like proteins, nucleic acids, sugars, starches and the other compounds that make up living cells. The two most common sources for hydrogen are fossil fuels (also known as hydrocarbons – compounds that consist of hydrogen and carbon), and water. Currently, fossil fuel reforming makes up 95% of hydrogen production, however this hydrogen production method emits a significant amount of C02 emissions. So much so that it has become a barrier to growth in clean energy applications – there is no point in driving a car using hydrogen if that hydrogen is sourced from CO2 intensive processes. The second mainstream production method of hydrogen is electrolysis, which is potentially emission free. However, the process requires an incredible amount of energy to produce hydrogen. And even though that energy can potentially come from renewable sources, there are significant capital costs and energy costs attached to the process . Elon Musk famously stated, “Hydrogen is always labelled the fuel of the future – and always will be”. But with Hazer – perhaps the future is now? The revolutionary Hazer Process could finally help hydrogen break through as a viable long-term fuel for the future. Unlike current production methods, the Hazer Process offers potentially low cost and low emission hydrogen, making it a viable solution for the transport market.